One of the main functions of the kidneys is to filter metabolic products out of the blood. If the kidneys are no longer able to do this, the blood has to be artificially purified and drained of excess fluid. This is the purpose of dialysis. Around 10% of the current 5,000 or so dialysis patients in Austria use the flexible method of peritoneal dialysis, in which the peritoneal membrane is used as a filter. 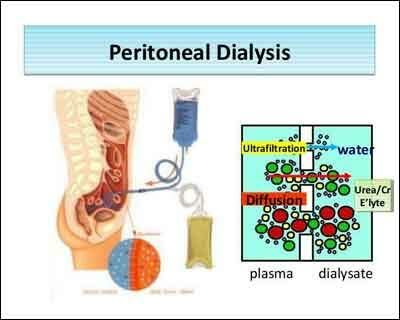 Peritoneal dialysis allows them to the mobile and independent. However, after a short time, the peritoneum can become “exhausted”, if important endogenous protective mechanisms fail to act to protect against the dialysis fluids. To look into this and to find new therapeutic approaches, the Christian Doppler Laboratory for “Molecular stress research in peritoneal dialysis” has now been set up at MedUni Vienna. The head of the new CD laboratory, which is funded by the Federal Ministry for Science, Research and Economic Affairs (BNWFW), and was opened, is Klaus Kratochwill from the Department of Pediatrics and Adolescent Medicine, which uses peritoneal dialysis in particular to spare children and adolescents from the stressful process of hemodialysis. The specific aim of the new CD Laboratory at MedUni Vienna is “to be able to clearly define which patients are suitable for which type of dialysis, in the sense of personalized medicine. And also to explore why the body’s own natural protective mechanisms do not kick in to combat the dialysis fluid, thus allowing the peritoneum to be damaged and how we can improve this situation,” explains Kratochwill. Promising clinical studies in the use of new substances to boost these protective mechanisms are already underway in collaboration with corporate partner Zytoprotec GmbH. The effect of adding glutamine is that this inhibited self-protection, the so-called cellular stress response, is reactivated and the endogenous cells are better able to protect themselves and other cells. If this effect could be achieved on a long-term basis, peritoneal dialysis could act as a bridge to extend the waiting time for kidney transplants. Currently more than half of patients experience problems with treatment within the first two years, while the average waiting time for a kidney in Austria is three years. In many European countries it is even longer. Kidney failure is predominantly due to genetic causes but can also be a consequence of diabetes or poor nutrition and, according to the World Health Organisation (WHO) it is a rapidly growing health problem. Currently there are around 2.5 million dialysis patients worldwide and, according to WHO estimates, this figure will reach around 3.8 million by 2020. The reasons for this increase are primarily the greater availability of dialysis but also longer life expectancy in general, as well as poor nutrition and various infections.